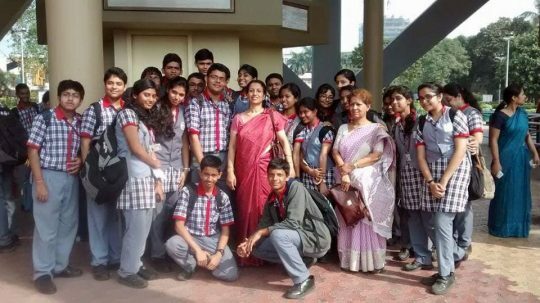 Little did Lily Mitra realise that relocating to Kolkata would plant the seeds of an ecopreneur in her, that too post-retirement. An M.Sc. (Botany), B.Ed., and a science teacher with over three decades of experience, Lily founded a tidy little enterprise called Udvid Plant Boutique. Having to come to terms with her life in a ‘gardenless’ space in the city as compared to her earlier stay in an industrial township, she started creating handcrafted potted plants which garnered attention among family and friends. After much coaxing by her daughters, she founded her own Plant Boutique at her residence in Ballygunge, Kolkata in July 2016. Lily in her Bokaro home – the green old days! As a young girl, Lily grew up in a small town in Hooghly district of West Bengal, where ‘green’ was more the norm unlike it is today. “Climbing on fruit trees and munching on fruits in the neighbour’s garden was a prank that I commonly indulged in as a child. Later in life, I got myself a Master’s degree in Botany from the Calcutta University. Inherently, proximity to plants has always made me happy,” smiles Lily. She continues, “When I got married, I had to move to an industrial township, namely Bokaro Steel City, along with my husband, and in the later years, we had the privilege of a huge space in the front and backyard of our quarter. That was my first foray into formal gardening – landscape gardening with ornamental plants, flowering plants and a big enough vegetable garden,” says Lily describing what may have been her first tryst with gardening. As fate had it, she got transferred to Kolkata in the late 90s and lost the privilege of a ‘garden’ almost overnight. Lily pined and craved for the company of her plants and as a result, began nurturing potted plants on the small terrace space in their house. (though it was much smaller than her garden in Bokaro). Eventually, she began experimenting with other natural materials and objects that could be used for creating miniature gardens for urban living spaces. It began as a personal hobby, but soon Lily’s friends and relatives began asking for copies of a couple of her creations! “My daughters egged me on to create more such collections to be offered to the world outside. When I retired in June 2016, I almost instinctively turned to my plants and thus, Udvid Plant Boutique was born. The first formal attempt to get it up and running was through a Plant Show at our house in August 2016. Since then, there has been no stopping despite other commitments of mine, though I admit that I am still more of a creator and a plant-nurturer rather than a businesswoman,” mentions Lily. As far as plants, gardening or business are concerned, Lily never had any formal training. However, her creative instincts and sheer love for plants have led her to develop Udvid Plant Boutique. “I was familiar with the plant kingdom, courtesy my ‘green’ childhood, the garden in Bokaro and my formal education. But the way I experiment with plants at Udvid Plant Boutique and curate them for small urban houses in aesthetically appealing formats is something I have never done before. In fact, my daughters also helped me learn from the internet and fuel my ideas further. So, I had to burn the midnight oil to learn how to grow these plants in smaller spaces, on different materials like a log, a seashell, a pine cone, a bamboo planter and so on. This is like any other art. I look at my plants like babies. I see which planter it could adorn the best or, which other plants will thrive together and look good too. My daughters often tease me that these plants are their step-siblings. Even a minute that I spend out of the terrace especially during the daytime, makes me restless, wanting to go back to my plants,” says a passionate Lily. Being a Biology teacher and one who has always viewed the environment with regard, Lily would explain to her students why it is so important to secure their share of oxygen on this planet and not take this gift from the planet for granted. Lily believes that all organisms other than human beings play their role of giving back to the ecosystem they derive their food from, so we must do our bit too. Each creation is very dear to her. She often goes to great lengths to make the same plant look different in different kinds of planters. She travels to places far and wide, including rural areas, to collect different species of plants or innovative planters, but this is not something everyone is going to understand. “When we participate in exhibitions in Kolkata or Mumbai, the sheer effort and care required to transport the plants (my dear creations) is huge. Overall, it’s a logistics intensive business,” admits Lily. However, what concerns her most is dealing with the mindset of the people. “I feel disappointed when some prospective buyers visiting my boutique say they don’t have time for even watering the plant daily. It’s like saying we don’t have time for our bath or meals,” shares Lily with regret. “When we are at lifestyle exhibitions or even organic farmers’ markets, we are always competing with consumables like – clothes, jewellery, food and other lifestyle products. Some of us even spend thousands of rupees on things that we already have at home. Whatever attention we have got so far amidst that clutter, thanks to my children – my dear plants, has been bliss. People ask how I make them, will the plants live like that forever and so on. My plants definitely pique the interest of passersby. The demand is yet to pick up though. I trust that there will be a time when people will feel the need to pay for the ever-so-generous oxygen providers, just like they pay for food, clothes, house or anything else,” smiles Lily. Lily further adds that she would be happy to help people think differently about the need for plants. That’s why she invests a lot of time and effort in putting together plants in formats that can thrive in low light, less space and with low maintenance. “But they are living beings, so one cannot make that purchase in the same manner as living room furniture,” she adds. One can tell her passion when she says, “Sometimes, the pain of giving one of my children (my plant) away to someone else is higher than the joy of making a sale, but I revel in the joy that my creation will lend oxygen to someone else.”By turning into an entrepreneur in a stream that is so close to her heart, Lily will be able to rekindle the long-lost love for plants, one creation at a time. Udvid Plant Boutique curates ornamental plants ranging from ferns, crotons, coleus, begonia, euphorbia, creepers, succulents, a few ornamental flowering plants, and a few in the bonsai format. Their speciality though lies not in the plants they curate but the way in which Lily puts them together for city dwellers who have less space, limited sunshine and time. Their miniature garden format is good for urban residents who love a house with a garden, for example. The price varies depending on how rare the collection is, or, the amount of time and effort spent in assembling the collection in appealing formats. It ranges from Rs. 200 and goes upwards of Rs. 2000. “The entire collection is my baby and I curate each plant personally. This is not something I want to outsource to anyone. It’s a very soulful and satisfying experience for me to put together each and every collection. The pleasure involved in making them far outweighs anything else that we encounter while putting them on sale,” says Lily. What makes Udvid Plant Boutique unique? What makes Udvid Plant Boutique unique is that Lily mindfully creates small sized plant collections that can thrive on occasional sunlight and watering, in unusual yet visually appealing formats. This, in turn, attracts young urban consumers who can do their bit without worrying about maintaining too many plants and still feel the gracious company of ‘living’ plants in their home and office spaces. Sadly, there’s very little awareness of such kinds of plants. But the fact is, Lily explains, that it is not important to know what these plants are. It is important to just have a loving eye towards them. 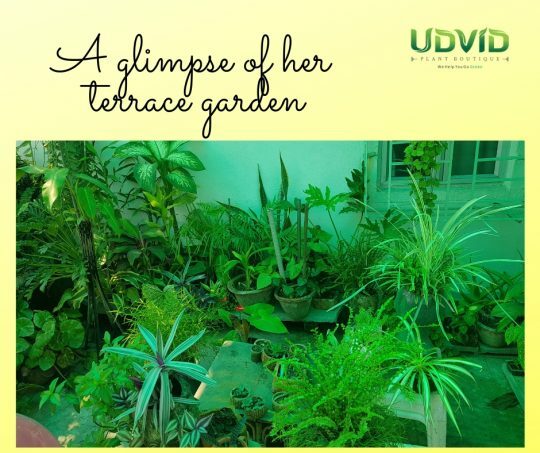 Being a living organism, they tell us what they need in their own way – just watching over them daily, checking the soil condition or, the freshness of leaves and watering them, is good enough for one to learn as they go; and for all Udvid customers, she is just a call away. “Most people don’t see it as a necessity to grow plants or some humbly walk away saying ‘I don’t have a green finger’. The point is that we must be responsible for our own share of oxygen. If we care, we will figure out time and ways to maintain plants just like we manage other household chores. I understand that it will not be easy convincing people as we are not selling utility items or consumable products. But we are truly grateful for those customers who choose to buy plants from us over other lifestyle goods. Admittedly, they are at a higher level of consciousness towards health and environment”, explains Lily. Over time, we would love to work with interior designers for office or home spaces who are offering ‘green’ or alternative solutions with ‘real’ plants which are aesthetically curated. 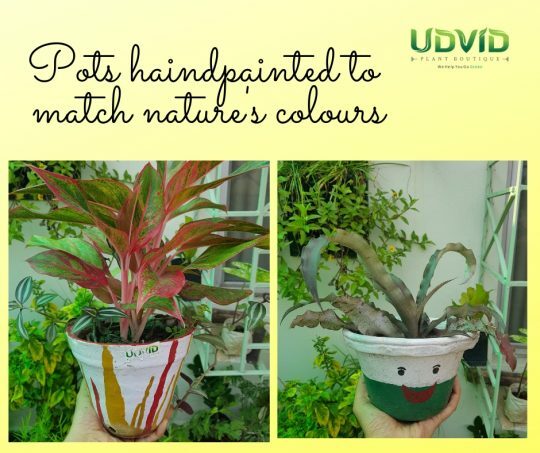 To get in touch with Udvid Plant Boutique, click here.